February Newsletter 2017: Make it an Extra Special Valentine's Day! A Great Valentine's Gift! Our Daddy Daughter Makeovers or Mother Son Fun Valentine's Package makes such an awesome valentine's gift - or gift for any other special occasion! And right now, it's at a special price of only $29.95! The Daddy Daughter package includes one Diva Day and a FREE certificate with 4x6 photo. Our cool Mother Son Fun Package includes a boy's haircut with fun color (mom gets matching color in her hair) and a fun keepsake 4x6 photo! Call to schedule your appointment now (at participating locations)! Diva Day & Mad Manes Gift Certificates! Great for birthdays, holidays, or any other fun event, our amazing Diva Day and Mad Manes gift certificates (for the boys) are a perfect surprise! These certificates include $10 of purchases from our FUN Toy & Bow Boutique, as well as a Diva Day (mini makeover) - or kids haircut & colored stripes for the boys. So if you'd like to treat your kids to an experience they will long remember, be sure to ask your local store about Diva Day & Mad Manes Gift Certificates! 2016 was a great year for Shear Madness! We had strong revenue growth in our franchise system and concluded the year with lots of momentum going into the New Year. However, what we're most thankful for is our fantastic franchisees and how together we're building on our Core values and carrying forward our message that at Shear Madness Every Child matters. If you are looking for an opportunity to franchise with one of the fastest growing kids hair salon franchise systems around, check out our Franchise Opportunities! Positive and Fun all Month Long! Are you looking for a fun and positive place online that helps brighten your day? If so, you'll LOVE our funny jokes, awesome customer feedback and more - and it's all happening right now at our amazing Facebook page! And if you want even more Shear Madness, be sure to check out our constantly updated Franchise Blog, Instagram, Google+, Pinterest and Twitter! Fall in Love with our Coupons! Do you LOVE saving money? If so, you'll love our great offers available on our coupon page! For example, one of our coupons is for a "Buy 2 Get 1 Free on all BOWdacious Bow Hair Bling"! WOW! So if you're out shopping for your Valentine, birthdays, or another special occasion - don't miss all those great deals you’ve been waiting for over at the Shear Madness Haircuts for Kids coupon page! Valentine's Holiday Crafting! Don't miss our cool Crafts for Kids section on Pinterest, where you'll learn how to make a flowering heart tree (as seen at right), cute love bugs, a "bee" mine valentine decoration, handprint frames, a funny Valentine's character made from a red cup, DIY owl treat bags, candy filled valentines, fingerprint heart ornaments and much more! Have fun, and have an extra special Valentine's Day! December 2016 News: Christmas at Shear Madness! Looking for a Unique Christmas Gift? Shear Madness Haircuts for Kids is THE Christmas shopping destination for unique and fun Christmas gifts! Not only do we have awesome haircuts, ear piercing and parties - but our stores are filled with cool toys and games, kids hair products, jewelry and more! And don't forget that Shear Madness also offers Gift Certificates, which makes a great stocking stuffer too! Also, Call to order - we can mail to an address you choose, at no additional charge! Plus, with any $35 or more purchase, we'll donate a toy for Toys for Tots (at participating locations)! Wow! Great Christmas Specials: Looking for that perfect Christmas gift for a daughter or granddaughter? If so, glamour, glitz and a whole lot of fun is what you'll get when you plan your next party at Shear Madness! Our Pink Starlets help host your child's party, along with creating fun up-dos, applying make-up and polishing fingernails! It's an awesome experience! For more details, please click Shear Madness Kids Parties! PLUS! Check out our coupon page for even more great deals, like 20% off any Hair Styling Product (at participating locations)! Holiday Fun on Social Media! To our many awesome followers on Facebook (which is now well over 36,000), we'd like to say a special THANK YOU to each of you for your great feedback and fantastic photos! You all are GREAT! And if you want even more Shear Madness fun - like kids jokes, cool crafts and great photos of kids having a blast in our stores, why not check out our Franchise Blog, Instagram, Google+, Twitter, and our favorites pins on Pinterest! Shear Madness Cheer All Year Long! Are you looking for something that might help bring you a little cheer all year long? 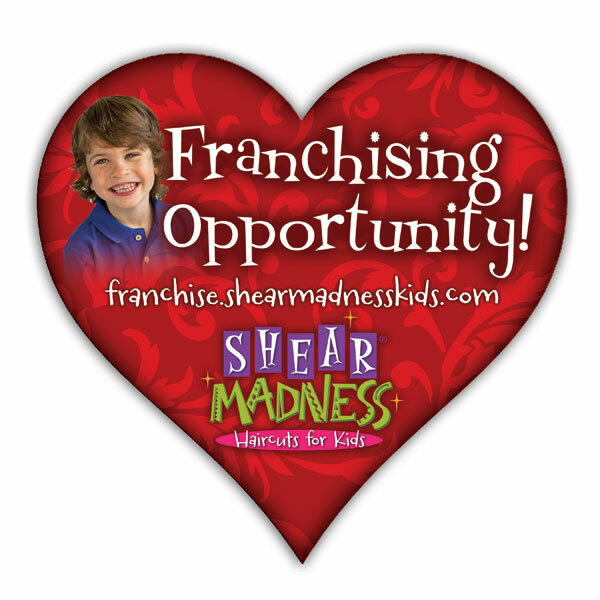 If so, now might be the perfect time to find out more about franchising with Shear Madness Haircuts for Kids! Check out the many helpful resources on our franchise website by clicking: Franchise Opportunities. We also have a lot of great free resources for business success - which you can check out over at our blog or by calling 1-888-98 GONE MAD! Ho, Ho, Ho! 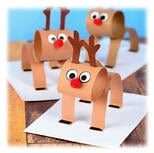 Kids Christmas Crafts! Deck the Halls with these Cool Kids Crafts! Bring a little Holiday Cheer to your home with these fun Christmas Crafts - all of which can be found on our Crafts for Kids section on Pinterest! You'll learn how to make cool handmade ornaments, adorable paper plate angels, reindeer made from cardboard tubes (as seen at right), jeweled Christmas Trees, your very own jingle bells, Christmas light suncatchers, easy icicle ornaments, finger print tree ornaments, Holiday coloring pages and much more! February Newsletter: Valentines Special Sales! Love is in the Air! Looking for a unique way to show your love this Valentine's Day? If so, a Daddy Daughter Makeover or Mother Son Fun Package might be just the gift! Shear Madness is offering these special sales until Feb. 29. The Daddy Daughter Makeover includes a Diva Day (fun hairdo, mini manicure & sparkly makeup), 4 X 6 Frameable Picture, & a Keepsake Ring - all for only $29.95! Add a Haircut for Dad for only $10! The Mother Son Fun Package includes a guys haircut & fun color (mom gets matching fun color), a 4 X 6 mother / son photo, a cool ring, or mom & son decorates a super hero mask & cape for son to keep! Call to schedule your appointment now (at participating locations)! Diva Day & Mad Manes Gift Certificates! A great Valentines gift idea, our Diva Day and Mad Manes gift certificates (for the boys) are a perfect surprise! These certificates include $10 of purchases from our Toy & Bow Boutique, as well as a mini makeover (or haircut & colored stripes for the boys). So if you'd like to treat your kids to an experience they will long remember, be sure to ask your local store about Diva Day & Mad Manes Gift Certificates! Spring Break Classes: Hurry, these awesome classes are filling up fast! If you are ready to learn how to create some really cool hairstyles and impress your friends with your great glamour know-how, these classes are just the thing! Keep an eye out for more details coming soon on these cool classes being offered by your local Shear Madness Haircuts for Kids! It's going to be AMAZING! 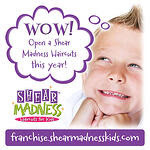 Did you know that Shear Madness Haircuts for Kids experienced tremendous growth in 2015? As the Franchisor it would be easy to look at that growth and think that we had a lot to do with it. However, it was truly because of our great franchisees! If you are looking for an opportunity to franchise with one of the fastest growing kids hair salon franchise systems around, check out our Franchise Opportunities! Shear Madness Fun all month long! This rockin' online party has FREE Haircut Fridays, funny jokes, awesome customer feedback and more - and it's all happening right now at our amazing Facebook page! And if you want more Shear Madness, why not check out our constantly updated Franchise Blog, Instagram, Google+ and Twitter? Also, don't miss out on some of our favorite Shear Madness pins this month on Pinterest! You'll Love our Coupons! Do you LOVE saving money? If so, you'll love our great offers available on our coupon page! For example, one of our coupons is for a "Buy 2 Get 1 Free on all BOWdacious Bow Hair Bling"! Awesome! So whether shopping for your Valentine, birthdays, or other special occasions - you're sure to find that great deal you’ve been waiting for at the Shear Madness Haircuts for Kids coupon page! Fun Kids Crafts for Valentine's Day: Have an extra fun Valentine's Day and create a special memory with those you LOVE by making some awesome Valentine-themed crafts! Don't miss our cool Crafts for Kids section on Pinterest - you'll learn how to make "Love Bugs" out of fruit cups, paper plate dinosaurs, Valentine's heart paper chains, a handprint bug Valentine craft, Valentine's Day bird feeders, rainbow heart suncatchers, ideas for 48 Noncandy Valentines for Kids and much more! Have fun, and have a great Valentine's Day!